So allow me to explain myself. And try as I might to work up the courage to leave the house looking like that, my vanity always gets to me. And unlike long messy hair that can be pulled into a ponytail or mid-length messy hair that can be subdued with a sufficient number of snap clips, most of the time getting my hair presentable again from this condition requires starting over with a wash and a blowdry. So getting back the 40 minutes I used to spend shaping the curls in my long hair for special occasions feels like something of a Pyrrhic victory when I suddenly have to wash and dry my hair to go to the post office. So that’s the main reason I want some length back in my locks (not nearly what I had pre-wedding, I’m thinking somewhere between chin and shoulders). The other, admittedly contradictory, reason is that I kind of MISS spending 40 minutes shaping my curls, or at least having the option to. 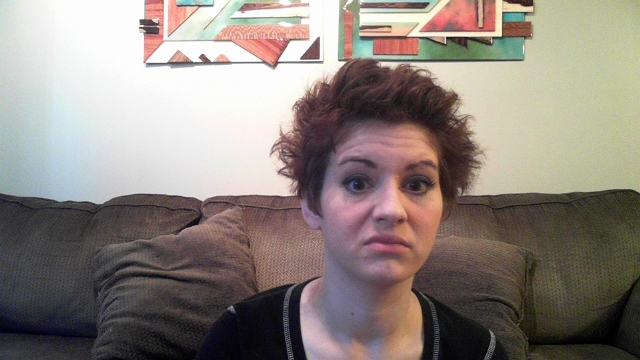 I miss variety in my hair styles other than “messy” and “neat.” I’m terribly fickle when it comes to my hair. Which is why you can bet your bottom dollar I’ll cut it all off again sometime in the next five years. So if you really are bereft that I’m going to grow out my pixie, just wait. I had a pixie in high school. I totally hear you. It required work even though it didn’t look like it. And yes, wash every single day, and sometimes twice a day. Cuun! Your hair is super soup!!!!!!!! Don’t PREtend! MMMMM SOUP TOOP in a pocket of FOOP MOOPS! I spent much of my teens and 20s in a constant state of growing out and cutting off my hair, so I totally hear this. 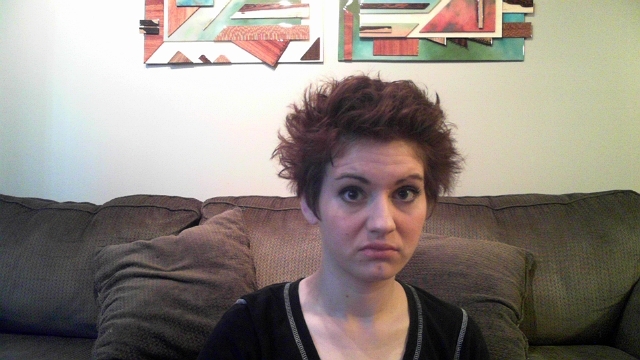 Pixie cuts require serious maintenance and allow zero flexibility. When I reached my 30s, I finally gave up and realized that I (and my hair) are happiest at a medium length of below chin, above the shoulders. These days, we are quite fond of a bob that flips at the bottom. I find this to be the most versatile cut. I can style it smooth and flat or let it dry naturally and flip. Either way it generally looks kempt and attractive without requiring product or a lot of time and effort. So, to recap: with age, I have become lazy. I’m jealous. I mean, I don’t have hair. But I support you. No one wants an unruly ‘do. 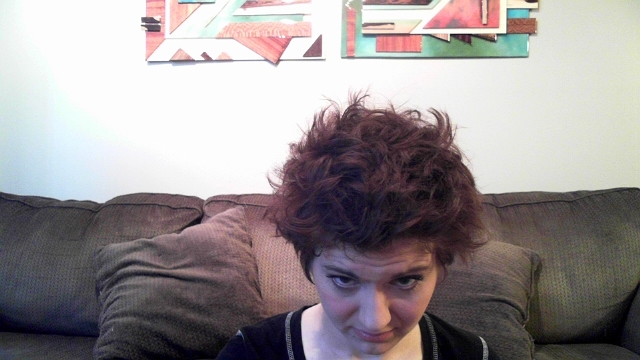 Can I just say that I’m a bit jealous of your mad scientist hair? My hair is straight. And flat. Which means it only does one thing, no matter how much product I put into it. I envy your ability to do messy & tousled. Grass is always greener I guess! Yeah totally, I have your typical thick stick straight Asian hair which is great for my daily low maintenance habits but when it comes to doing more fun and interesting stuff, it takes a lot of work even by regular standards. I had really long hair in high school and so for prom I want to go all out on this fancy do and no joke, the hairdresser spent two hours and two entire cans of hair spray on the whole thing. And probably about 2 pounds of bobby pins. Anyway as soon as I started taking out some of the bobby pins at the post-prom party, the whole thing fell down and it looked like maybe I had braided it while wet and slept on it. I sort of love the mad scientist look but I guess what I really love is that you won’t leave the house with it but are willing to post photos of it on the internet. Don’t ever change, Robin. I wish I were braver in making big changes like that…I’ve resolved that the next time I’m in Boston where the best hairdresser I’ve ever had is, I’m going to go in and fulfill a middle school ambition of getting some anime character style highlights in my hair (like blue or purple or aqua). All I’m saying is, there are an awful lot of people who can spend time trying to shape their curls, tame their hair, etc. I can tell you this from experience. But there are very few people who have the bone structure and the eyes and the youth (no droopies! no jowels!) to pull off the pixie cut. You being one of the few who do, I feel you are obligated to take advantage. DON’T TAKE IT FOR GRANTED. THE CHEEKBONES YOU HAVE ARE NOT NORMAL. When you said you were growing your hair out, I did not even blink, because you have been growing your hair out and then cutting it off since I have known you. Oh man. You look like Robert Pattinson. At least his hair. Just sayin’. I mean, it’s still totally hot, even on a chick. I feel you. I find slightly above shoulder length to be the easiest – I just have to dry it, I don’t even need to straighten it, and it’s easy to pull back or put up all fancylike. 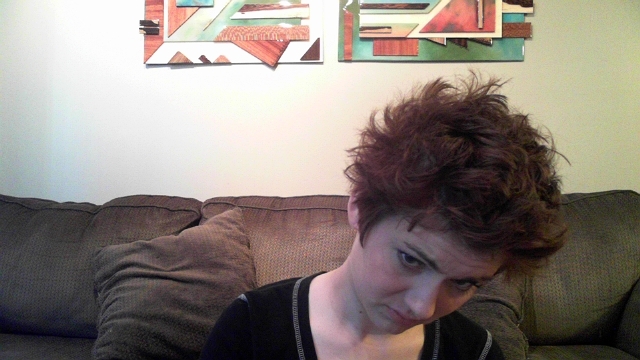 Although I, too, dig your mad scientist hair. I am doing the exact same thing for pretty much the same reason. And also, because I have dreams where I miss my long flowing locks… I’m just bracing myself through the mullet/wings stage and wishing for the stylish short bob that will eventually come. Growing out your hair can be the pits, but I will persevere! Good luck with your journey! I’ve had a pixie cut for about 1 and a half years now and I couldn’t decided if I should grow it out. I was fighting with myself over this decision but you just made it so much clearer for me! everything you just said applied to me! THANK YOU! Oh my gosh. Everything you just said is EXACTLY why I’m growing mine out. It’s rediculous. I love it and its cut me and looks great on me but honestly I’m a blow dry and go kinda girl. I’m thrilled that I found your blog today. I was two seconds away from grabbing my husband’s clippers and shaving this mess off!! I’m so tired of my hair staying in the same shape. It looked beautiful for the first week, then all hell broke loose. I’m ready to grow it out and feel like a woman again. Thanks so much for posting this! P.S. Your hair is awesome. You rock it well!